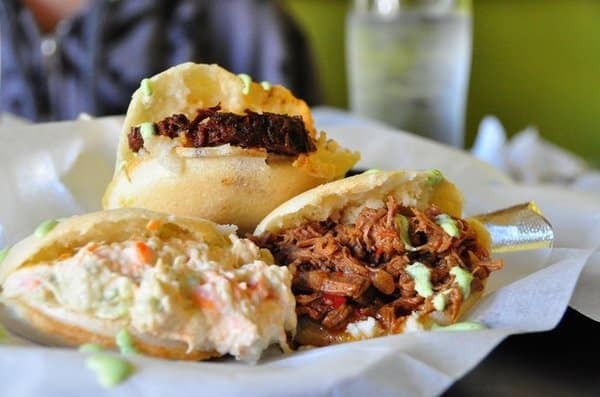 Arepas define Venezuelan cooking. These thick cornmeal patties are griddled, then baked, and then stuffed while warm with anything from white cheese to this zesty chicken salad with avocado mayonnaise (Johan Santanas first choice). The salad is named in honor of Susana Duijm, Miss World in 1955 and a popular Venezuelan celebrity. (Reina means "queen" in Spanish, and pepiada is perhaps most politely translated as "curvy.") The recipe comes from Maribel Araujo of New York's always-packed Caracas Arepa Bar in the East Village and her executive chef, Ilse Parra. 1 To make the filling, place the chicken breasts and onion in a medium saucepan and add enough cold water to cover by 1 inch. Add 1/2 teaspoon salt and 1/4 teaspoon pepper and bring to a simmer over medium heat. Reduce the heat to medium-low and simmer, uncovered, until the chicken is cooked through, about 15 minutes. Remove the chicken from the saucepan and let cool completely. Tear the chicken into shreds. 2 Mash the avocado, mayonnaise, and vinegar together in a medium bowl with an immersion blender or large fork until smooth. Stir in the cilantro, parsley, jalapeno, and garlic. Add the chicken, red pepper, red onion, and scallion and mix together. Season with salt and pepper. Taste and add more vinegar to give the filling a pleasant, but not sour, tang. Cover and refrigerate until ready to serve. 3 To make the arepas, stir 3 cups lukewarm water and the salt together in a large bowl to dissolve the salt. Gradually add 3 cups cornmeal, mixing with your fingers to dissolve any lumps, adding enough to make a soft dough that holds its shape without cracking when molded. Set dough aside to rest for 3 minutes. Add the oil and work it in with your hands, adding cornmeal or water to return the dough to the proper consistency. 4 Divide the dough into 6 equal portions. Shape each into a 4-inch diameter disk, about 1 inch thick. Transfer to a baking sheet. 5 Position a rack in the center of the oven and preheat the oven to 350°F. Lightly oil a large nonstick skillet or griddle and heat over medium heat. 6 In batches, place the arepas in the skillet. Cook until the underside is a splotchy golden brown, about 4 minutes. Turn and brown the other side. Return arepas to the baking sheet. 7 When all of the arepas are browned, transfer them directly to the oven rack (without the baking sheet). Bake until the surfaces of the arepas have formed a taut skin-if you rap your fingers on one, it will feel and sound like a drum. Return arepas to the baking sheet and let cool slightly. Split each arepa in half and fill with the chicken mixture. Serve warm. For arepas, you must use precooked cornmeal (labeled harina or harina precocida), imported from Venezuela. American cornmeal or corn flour and Mexican masa harina will not work. The most popular brand of precooked cornmeal is P.A.N., found at Latino markets or online at www.amigofoods.com. Use white (blanco) cornmeal only.